Fibre Channel over Ethernet Verification IP provides an efficient and smart way to verify Fibre Channel over Ethernet MAC, PCS and serdes of a SOC or a ASIC.The SmartDV's Fibre Channel over Ethernet Verification IP is fully compliant with standard FCoE Specification (FC-BB-5, Rev 2.00) and provides the following features. Compliant with the latest Fibre Channel over Ethernet specification(FC-BB-5) Rev 2.00. Compliant with SCSI Architecture Model 3/4/5 (SAM-3/4/5). Supports N,F and E ports. Support for multiple initiators and targets. Supports generation of all types of FC frames. Supports verification of all layers of Fibre channel. Supports 1G and 10G as per 802.3 Ethernet. Supports Fabric Login/Logout,Port Login/Logout and Process Login/Logout. Support for all SCSI commands. Support for multiple Logical Unit Number(LUN) addressing. Supports completely configurable target/device discovery. Supports Pause frame generation and detection. Comes with Tx BFM, Rx BFM, and Monitor. Proficiency to generate random frames and respond to frames in directed or randomized fashion. Rich set of configuration parameters to control Fibre Channel Over Ethernet functionality. Callbacks in initiator, target and monitor for various events. Fibre Channel over Ethernet Verification IP comes with complete test suite to test every feature of Fibre Channel over Ethernet specification. 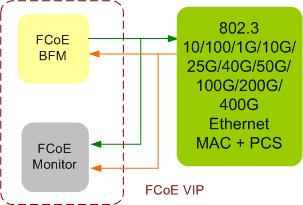 Functional coverage for complete Fibre Channel Over Ethernet features. Faster testbench development and more complete verification of FCoE designs. SmartDV's FCoE Verification env contains following. Complete regression suite containing all the FCoE testcases. Examples showing how to connect various components, and usage of Tx,Rx and Monitor.